We want to ensure that cricket is a game for everyone; full of great experiences whether you play, watch, follow, or work in the game. To help us improve, we need to hear your feedback, ideas and thoughts on how we can do this for South Asian communities. So, if you are part of – or involved with – Afghani, Bangladeshi, Indian, Nepalese, Pakistani, or Sri Lankan communities – we want to hear from you. The England and Wales Cricket Board is hosting a series of workshops around the country this summer, where you can let us know what you think and help us make cricket a better experience for all. At each of these events, we will listen to your views and focus on key points that have come out of our initial research (see ecb.co.uk/southasiancricket for the full research details). We would like to know; what are the current barriers to getting involved, what is going well, what are we missing and are there any new ideas that we could bring in? Your ideas and insights will help us build our future plans. Maybe you are a community leader, regular player, casual player, volunteer, coach, school teacher, an armchair fan or parent whose children love the game – whether you play any form of the game, are involved in cricket or not, everyone is welcome. Everyone who attends will be entered into a raffle to win 4 VIP tickets to England vs India or England vs Pakistan in the summer of 2018. All events will also have free food and drink and offer those who attend a chance to meet players plus free tickets to a local T20 Blast Match (see below). Please sign up to one of the events below and let us know about your views and experiences. We want to know what you think and help us to make this game better for everyone. 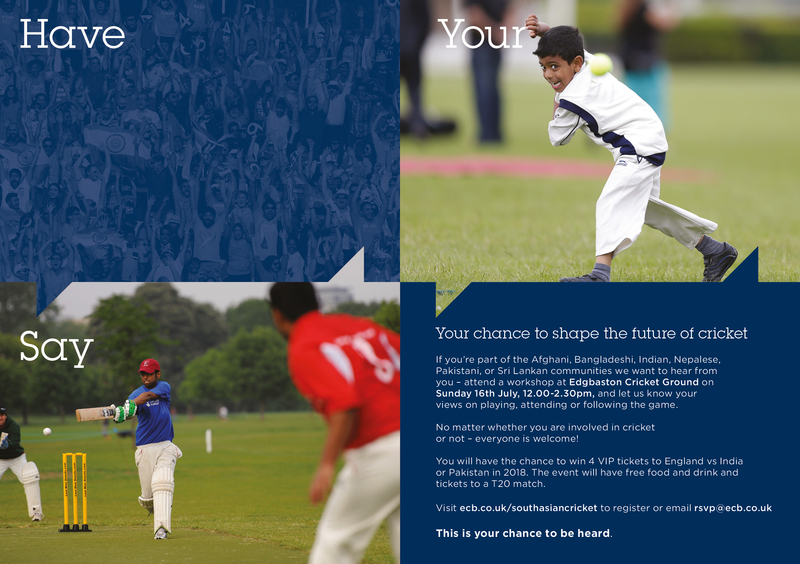 Visit ecb.co.uk/southasiancricket to register to attend or email <rsvp@ecb.co.uk>.